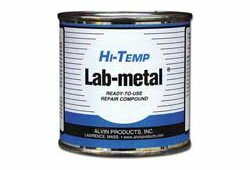 Ready-to-use aluminum-filled repair and patching compound. 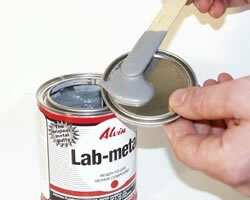 Spreads like paste, hardens into metal. Adheres to metal, wood, plastic, glass, fiberglass and more. Apply right from the can. Can be milled, drilled, tapped, ground and sanded smooth. Will not shrink or crack. Water resistant, rustproof. Withstands heat to 350°F (higher for one-time powder coating exposures). 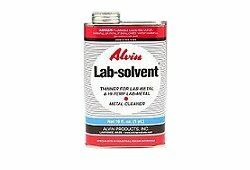 Thin with Lab-solvent for brushing or spraying. 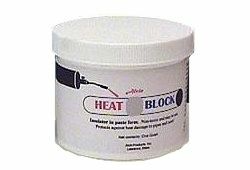 Durable, permanent filler for patching seams and cracks, rebuilding worn metal surfaces, repairing dented metal; finishing welds, filling holes and imperfections in metal castings. May be powder coated for single exposures up to 420°F, no longer than 20 minutes.